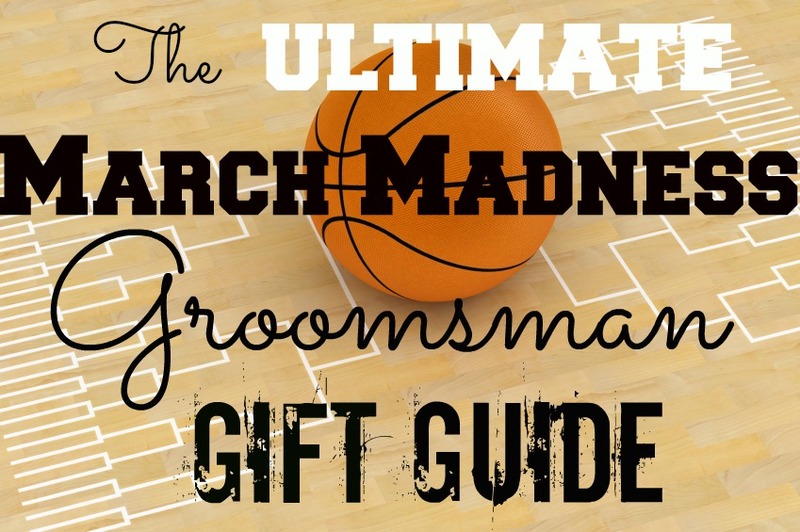 Thinking about incorporating March Madness into your wedding party gifts? This is a perfect time of year to give your groomsmen a gift featuring their beloved basketball team or alma mater. Here are a few of our favorite NCAA-themed groomsmen gift ideas. 1. NCAA Collegiate Sportula: Grill Spatula w/ Bottle Opener, $29.95. A great gift for both college basketball fans and grill masters, this stainless steel grill spatula, which includes a handy bottle opener on the handle, lets you to imprint your favorite team’s logo into your meat as you grill. Most teams available. 2. 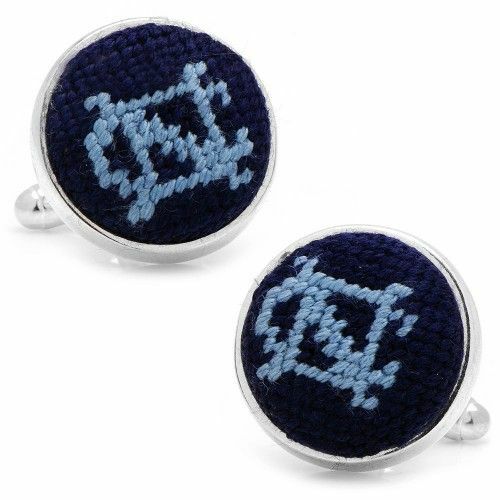 NCAA Needlepoint Cufflinks, $55 and up. A gift he’ll love wearing on the wedding day and beyond, these stylish, hand-stitched needlepoint cufflinks from Smathers & Branson add subtle team flair to his classy look. The handsome, ¾” needlepoint design is set in a silver-plated setting and features a bullet back closure. 20 popular teams available. 3. NCAA 4pc. “Boasters” Coaster Set, $24.95. 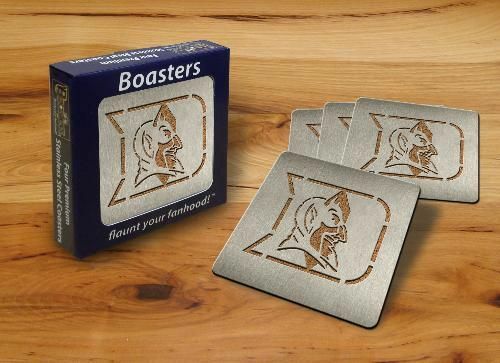 College hoops fans will love this set of four officially licensed NCAA collegiate “Boasters.” Each 4” x 4” durable coaster is made of heavy-duty stainless steel with your team’s laser-cut logo and a cork backing to protect furniture. 116 NCAA teams available. 4. University of Arizona Basketball Bamboo Cutting Board, $46. 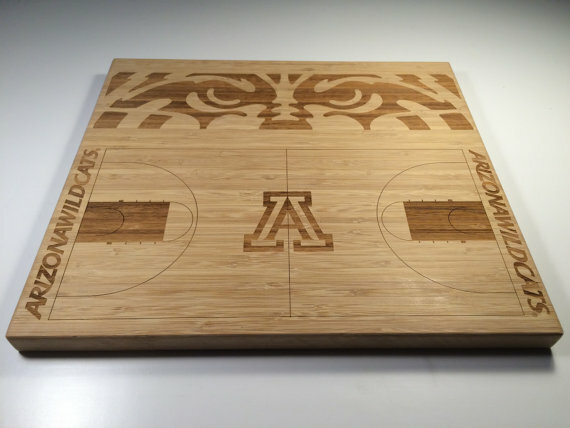 This handmade bamboo cutting board engraved the University of Arizona basketball court and Wildcat eyes, makes a great team gift for any chef, foodie or BBQ master. The licensed cutting board measures 13.5″ x 12″ x 0.75″. 5. 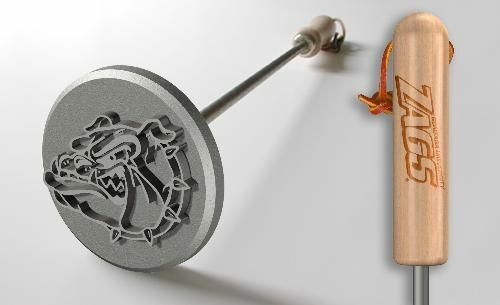 NCAA College Logo BBQ Branding Iron, $29.95. A perfect gift for guys who live for basketball, BBQs and tailgating, this USA-made, 14″ stainless steel brand lets you sear your team logo into steaks, burgers, chicken, pork, potatoes, buns and even pie crusts. The iron’s maple wood handle also features the laser-cut team name. Many popular teams available. 6. 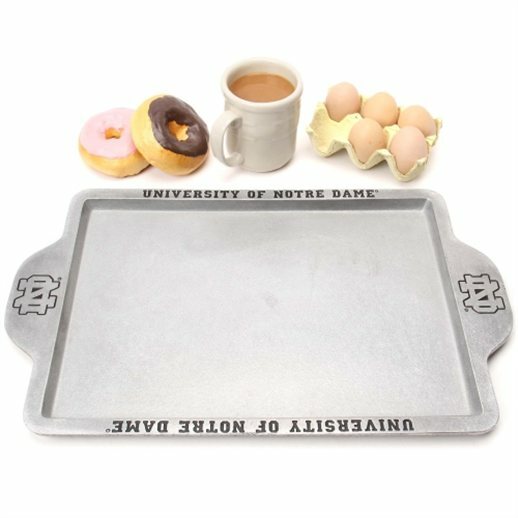 Notre Dame Fighting Irish Griddle, $59.95. Ideal for preparing and serving a hearty breakfast, brunch or lunch in the same dish on game day, this officially licensed, 11.5” x 19.25” griddle is decorated with the name and logo of his favorite team. The griddle is easy to clean and is extra durable. Several teams available. 7. 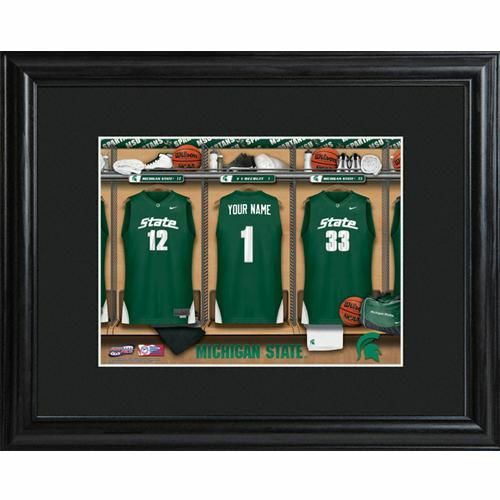 Personalized NCAA College Framed Basketball Locker Room Print, $79.95. This personalized NCAA hoops locker room print is the perfect accessory for his man cave or office. The print sports his name on the center jersey and the school’s name on the two outside jerseys. The print also features the school’s logo. Many popular teams available. 8. 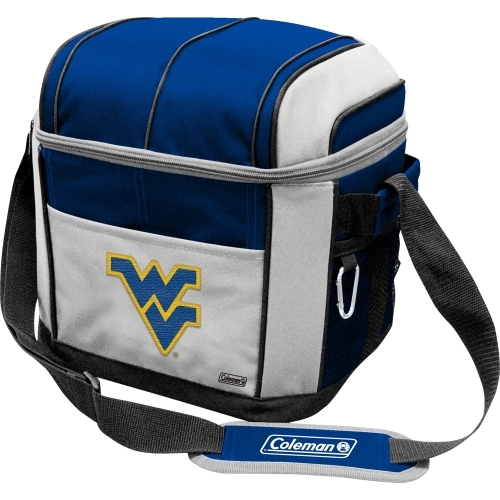 Coleman NCAA 24-Can Soft-Sided Cooler, $29.95. Perfect for game day, this Coleman 24-can, soft-sided cooler sports a full-color, embroidered NCAA team logo on the front. Made of durable 600-denier polyester, the officially licensed cooler features an adjustable carry strap with shoulder pad and a zippered closure to securely store beverages. Many teams available. 9. NCAA 2pc. Stainless Steel Can Holder Set, $24.95. Give his old run-of-the-mill beverage koozies a major upgrade. 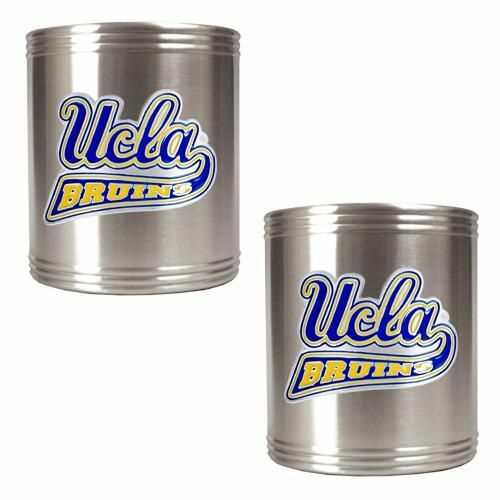 This matching pair of durable, officially licensed, stainless steel NCAA team koozies feature hand-crafted metal team logos and are designed to keep drinks cold for hours. Many popular teams available. Which of these NCAA items would be perfect for your groomsmen? Let us know in the comments section below. This entry was posted on Wednesday, March 25th, 2015 at 8:41 am	and is filed under Gifting 101, Wedding Party. You can follow any responses to this entry through the RSS 2.0 feed. You can leave a response, or trackback from your own site.